The market offers the finest natural and organic foods available. In the summer on Wednesdays, they have a local market. They also have a spot by the door to donate old cell phones. They sell toys made with recycled plastic, and many other eco-friendly items. 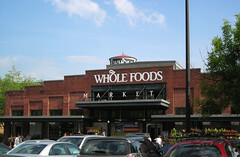 Their website is www.wholefoodsmarket.com and 410-433-0842.